With this Forms CD, you can now print over 200 rental forms that will help you make more money every month and take total control of every rental situation! Updated, Expanded and Revised. 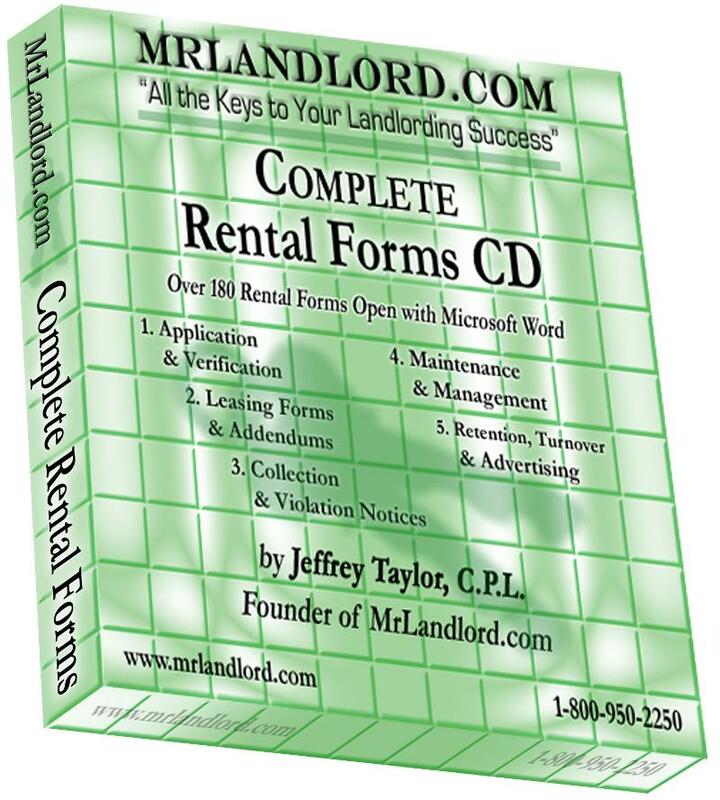 This bestselling FORMS program on CD is consistently one of the top three requested resources on this site and it allows you to use/edit/print any of the over 200 recommended rental forms featured in the MRLANDLORD.COM Handbook FORMS. This FORMS CD operates as a stand-alone program and it is easy to use. You can edit, delete or customize and save any of the wording on the forms. And of course, you can print any of the forms. This CD program is a great resource, which includes every possible form or letter you could need for most any rental situation, (200+ forms total), a "must have" for all MrLandlord.com visitors and subscribers. Personal note from Jeffrey Taylor: It's astonishing what will happen just by using the right rental forms. You will gain complete control of every aspect of your rental management. The forms work like magic! I have been compiling, perfecting and updating these forms over the last 30 years, because I am convinced that the rental forms you use to communicate with your residents will help determine the level of your rental success! I will reveal through these forms the absolute most effective ways to communicate with your residents that will put more money in your pocket, help you take control of every rental situation, and keep your residents happy, cooperative and staying in your properties for years! Receive this Rental Forms CD that will make you more money money each month, guaranteed or your money back. The regular price of this FORMS CD and Handbook which includes hard copies of all 200 forms is $199.95. However, we now offer just the FORMS CD to Gold and Platinum Club Member/Subscribers for HALF THE DISCOUNTED PRICE FOR THE CD-ROM OF FORMS, only $99.50 (free shipping). If you are not currently a member/subscriber, click now for membership info. If you are already a current Gold or Platinum Member/Subscriber and you wish to order the 200 FORMS CD at HALF PRICE, only $99.50, call our offices. Call 1-757-436-2606 to request FORMS CD and let the customer service representative know that you are a Gold or Platinum Member. If you do not wish to become a a Gold or Platinum Subscriber/Member at this time, but you wish to order the FORMS CD-ROM only at the non-member currently advertised price of $149.50 (25% off), click to add this bestselling resource to your cart.